How Does Debt Consolidation Affect My Credit? Hello everyone, my name is Paul J Paquin and I’m the CEO at Golden Financial Services. I want to start off by giving you a few of my credentials so that you can trust the information that I am providing you today. Helping consumers find the simplest way to get out of debt has been my focus since 2004. I wrote the book on debt consolidation.I am also certified by the International Association of Professional Debt Arbitrator (IAPDA), and Golden Financial Services is Accredited by Trusted company Reviews and A+BBB rated. Since we offer multiple debt relief programs and debt consolidation, you can trust that the following information is 100% unbiased and I will give you my best insight on the subject. See, most debt relief companies offer one program, so of course, they are biassed to that one plan. However, at Golden Financial we offer debt consolidation, debt settlement, debt validation, and consumer credit counseling, and therefore you can trust that we are not trying to push you in any one direction. Our goal is to help you get out of debt in the best possible way, depending on what your goals are. OK, enough about me, now let’s talk about you! The reason that the answer to the question, “will debt consolidation hurt my credit score?”, is not so black and white, is that it depends on what your current financial situation looks like. If you have an 800 credit score and comfortable income, your consolidation solution will be different from the person who can barely afford minimum payments and has a 650 credit score. Are you looking to save as much money as you possibly can, or just want to get out of debt in the quickest possible time-frame? Do you have a retirement date set for the near term and your goal is to become debt free before this date? Are you just looking to cut out some interest by using a low-interest loan to pay off your high-interest debt? Can’t afford minimum payments and need a lower payment? See, these are common needs that people have. Based on your specific needs is what will determine the right solution for you. Call (866) 376-9846 to Learn Your Options for FREE from an IAPDA Certified Debt Counselor or Keep Reading. Chapter 2: Does debt consolidation help credit? Chapter 4: What is the best way to consolidate debt? Chapter 5: Does debt consolidation go on credit? This debt calculator is more than just a debt consolidation calculator. You will see multiple debt relief options within one click! If you are currently paying around minimum monthly payments, try entering an amount that is a little less than what you are paying now. Of course, you can also enter more than the minimum payment amount, just to play with the figures and see different scenarios. The reason why is because your credit utilization ratio will improve after paying off all of your existing debt. Even though you are taking on a new debt, the consolidation loan, which can cause your credit score to go down, simultaneously you are creating a positive action by paying off your credit card balances. Paying off your existing credit card balances outweighs the negative effect of getting the consolidation loan because the older accounts have more influence on your credit score. The longer you’ve had an account, the more effect it will have on your credit score. This information is all assuming that you’re current on ALL credit card payments. If you’ve even fallen behind on a single payment over the course of the last 12-months, your credit score won’t be sufficient and high enough to get approved for a low-interest debt consolidation loan. So in that case why get a consolidation loan, when credit card hardship programs can save you more money and get you out of debt much faster. Why do you want to consolidate your debt? You either need a lower payment, want to pay less interest or just want to get out of debt faster, right? The only way to benefit from debt consolidation is to get a low-interest debt consolidation loan, which you can’t get unless your credit score is at least 720. The good news is, there are credit card consolidation hardship programs that are designed to eliminate interest and cut your balances by as much as 50% if you have a credit score of less than 720. If you have even a single late payment from the last year, call (866) 376-9846 and talk with an IAPDA Certified Debt Expert about credit card hardship programs that can cut your balances by 50% and eliminate ALL INTEREST! Ask about getting free credit repair included if your credit is a major concern! At Golden Financial Services we are often asked, is there a debt consolidation program that comes with credit repair? There is no debt consolidation program that includes credit repair, but there is a debt relief program that includes credit repair! Remember folks, debt consolidation is a loan. We don’t offer loans here at Golden Financial Services. We offer debt relief programs to reduce the amount that a person must pay to get out of debt. Golden Financial Services offers one of the only debt relief programs that include credit repair, in the entire nation. The program is called debt validation and it’s for delinquent credit card debt and most unsecured debt will qualify. You must have either fallen behind on payments already or can no longer afford to pay the minimum payments. To find out if you qualify just call (866) 376-9846. Best way to consolidate credit card debt? Go to a credit union and apply for a bank loan, but first shop around at 10-15 credit unions to compare rates. Go with the credit union who offers the lowest interest rates and fees. Balance transfer credit cards can be used to transfer your credit card balances, consolidating all of your debt onto a low to no interest credit card. The catch is that you MUST pay off your credit card balance on the balance transfer card within the introductory rate time period or else your interest rate will shoot up high. Also, balance transfer cards come with upfront fees that range from about 3-5% of the amount that you transfer to the card. If you transfer $50,000 in credit card debt to a balance transfer card, most balance transfer cards will charge you around $2,000 UP FRONT! Use a home equity line of credit to pay off your credit card balances because these loans come with the lowest interest rate and monthly payment. Just because it’s a “home equity line of credit”, does not mean you have to use it on home-related expenses. If you have third-party debt collection accounts, debt validation can dispute your debt and possibly prove it to be legally uncollectible, where legally you may not have to pay it. And in many cases, the debt and it’s associated negative marks can be removed from your credit report entirely. If you’re searching for the best way to consolidate your debt, you need to get a professional debt relief evaluation. At Golden Financial Services we offer debt consolidation, debt settlement, debt validation, and consumer credit counseling, so you can expect unbiased debt relief advice. Most debt relief companies offer only one debt relief program, which can make a person fearful to call that company because obviously, they will be biased to offer the one program that they have available, right? That is not the case at Golden Financial Services. You can trust our friendly advisors will give you all of your options after first evaluating your credit report and credit score for free. If you would rather not call Golden Financial Services and want to handle this on your own, here is the best advice ever on how to clear credit card debt on your own. Does debt consolidation go on your credit? When consolidating credit cards with a debt consolidation loan, your credit report will illustrate that a new loan was obtained. 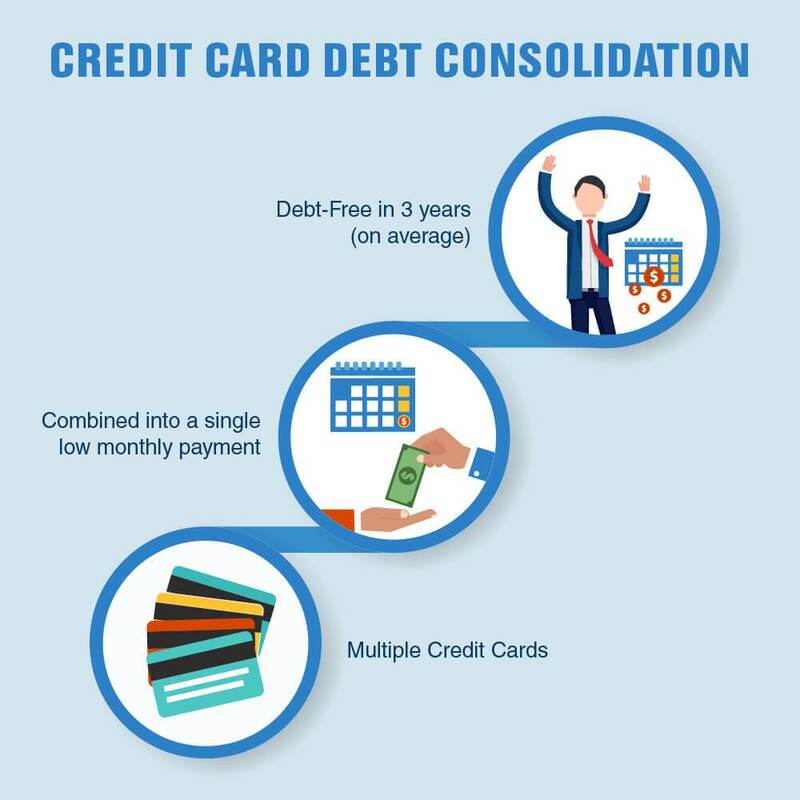 Some people will use debt consolidation to pay off credit card balances and then close out their credit cards, by closing out their credit cards that action hurts their credit score the most. The key to restoring your credit score is to use a debt consolidation loan to pay off your credit card balances and keep your cards open after paying them off. Here is why a debt consolidation loan can raise your FICO score. 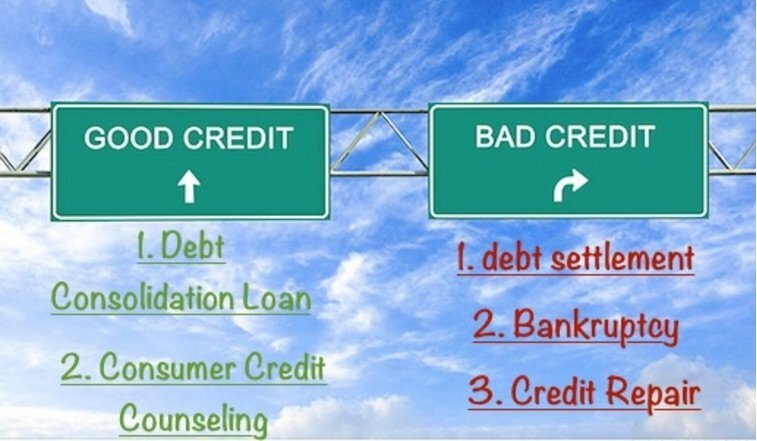 Your credit utilization ratio refers to – how much of your available credit is used up. Your credit utilization ratio makes up about 30% of your credit score. If your credit cards are all maxed out; your credit utilization ratio is extremely high, which lowers your credit score. A low credit utilization ratio improves your credit score. If you have a $10,000 credit limit, with a zero dollar balance, you have a low credit utilization ratio. Congratulations! By taking out a $30,000 debt consolidation loan; to pay off $30,000 in credit card debt, you can quickly pay off your balances in full and improve your credit utilization ratio – helping your Credit/FICO score go up. Once your credit card balances are paid off in full, now’s a good time to request a credit limit increase. Wait about 45 days after your credit card balances are paid off and ask the creditors to raise your credit limit by $5,000 to $10,000. By raising your limits, this improves your credit utilization ratio even more – increasing your credit score. Here is why a debt consolidation loan can hurt your FICO score. A. Future lenders could view you as a “high-risk applicant” because you now have a huge debt consolidation loan to pay back–plus potentially you could rack up credit card debt again. B. Applying for a debt consolidation loan will put a new inquiry on your credit report, lowering your credit score. Contact Golden Financial Services to learn more about debt relief programs and debt consolidation loans. This is the good idea to get a debt consolidation loan but I think everyone is aware about online debt reduction calculators which guides as well as a personal guide. Everyone should take care about credit limits because increasing limits will also eventually increases debt problem. I agree with the information you provided. Before diving right into enrolling in a debt settlement program, you need to know that not all debt settlement companies are good ones. There are so many online tools available who provides perfect calculations for debt.